Look at the ladies above. Can you belive that they are 48, 70 and 49 years old? 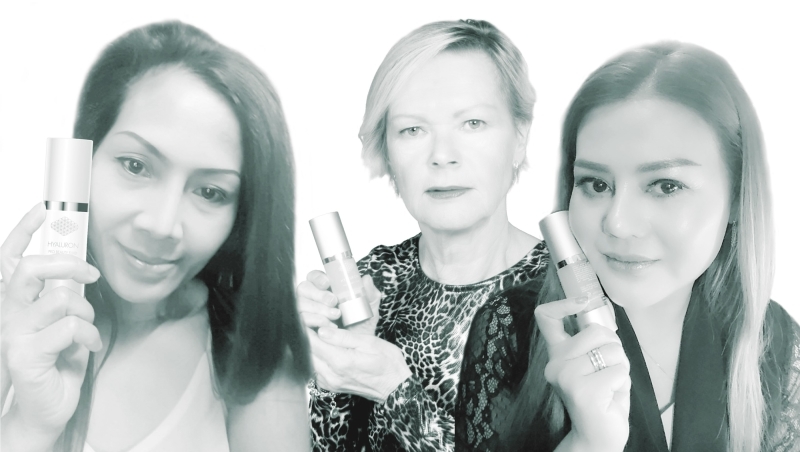 All of them use regulay BF Hyaluron Pro Beauty Fluid Serum. Two main factors affect the skin's aging process: First, the older the skin, the slower the skin metabolism. This results in reduced cellular energy in the fibroblasts that produce collagen and elastin. Secondly, the body's ability to produce necessary nutrients to these cells decreases. The result is a reduced collagen and elastin production, which gives skin less elasticity and elasticity. In the case of atropy (fluid loss), the upper and lower skin loses its excitement - signs of wrinkles and lines appear. Hyaluron production in the body decreases gradually after the age of 25 and the skin loses its elasticity and clear lines appear. The sooner the treatment begins, the better the results. Our product BF Hyaluron Pro Beauty Fluid contains a formula with 2% high-concentration low molecular weight hyaluronic acid. Higher concentration makes no use. The hyaluronic acid can not emulsify and penetrate the skin in depth where it benefits. The hyaluronic acid simply clumps. What is hyaluronic acid? Despite the name, hyaluronic acid is actually no acid without a sugar molecule. A bodily substance found in all cells and cell walls. The substance has important functions in the body of all humans, animals and plants. It moisturizes and lubricates the skin into the deep layers and lubricates the joints. Hyaluron is present in the eye with a concentration of 2%. Half of the fluid in the skin is Hyaluron. In relation to its mass, hyaluron binds incredibly much fluid. One gram of hyaluron can bind 6 liters of water, which makes the skin have a really good depot of moisture. Thus 6000 times its own weight. 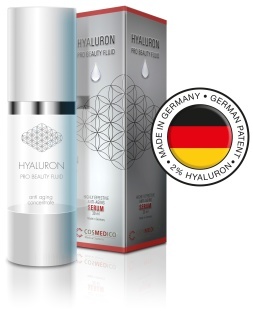 Hyaluron keeps poison and free radicals away, protects against UV light, and facilitates transport between the cells. How does collagen affect the skin? Collagen is the body's most common protein. This structural protein is a crucial component of the connective tissue and the skin. Collagen fibers have enormous tensile strength and are barely elastic at all. Collagen strengthens the structure of your skin and connective tissue. How are you affected by elastin? Elastin is a component of the intercellular substance (that is, the substance that exists between the body's cells). It affects skin condition and maintenance. Unlike collagen, elastin is elastic and stretchable. Elastin is commonly found in the skin and makes it resilient. Please contact us by email if you would like information about the nearest dealer or if you think you are a reseller who wants to work with us!